Now freely available: issue 34:1. Read it online here. 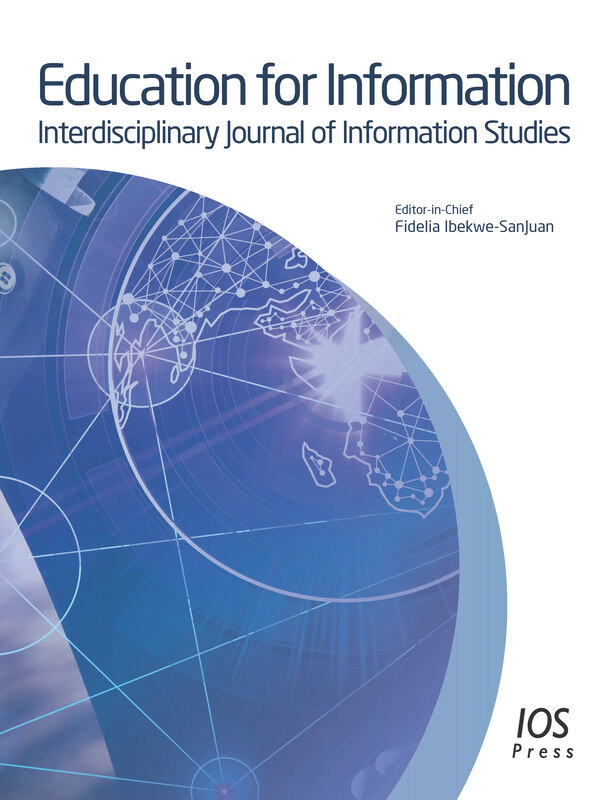 Education for Information (EFI) welcomes a broad perspective on issues related to pedagogy and learning in the information and communication disciplines (ICD) such as Library and Information Science, Communication and Media studies, Journalism, Archival studies, Museum studies, Psychology, Cognitive science and Digital Humanities. Information and information practices as objects of teaching and learning in all academic disciplines and countries. Full-length articles and literature reviews should be between 5000-8000 words of text excluding the references. Commentaries, funded innovative research protocols, short communications and book reviews should be between 1000-1500 words of text excluding references. Reviews of submitted articles will be double-blind. Note that the manuscript should be uploaded as one file with tables and figures included. This file should be a Word document. Manuscripts must be written in English. Authors whose native language is not English are advised to seek the advice of a native English speaker, before submitting their manuscripts. Through Peerwith you can get an offer from a language and copyediting expert to ensure your paper has the appropriate level of English. You may expect to receive free and non-binding quotes from experts in your field of research within 24 hours after submitting a request. Authors are requested to use the APA (American Psychological Association) citation style. APA in-text citations should include the author's last name followed by the year of publication. All publications cited in the text should be presented in an alphabetical list of references at the end of the manuscript. Submitted articles can be listed as (author(s), unpublished data). See their website http://www.apa.org for more information. Authors are responsible for checking the accuracy of all references. Manuscripts will not be considered if they do not conform to the APA citation guidelines. Anderson, A. K. (2005). Affective influences on the attentional dynamics supporting awareness. Journal of Experimental Psychology: General, 154, 258-281. Anderson, A. K., Christoff, K., Panitz, D., De Rosa, E., & Gabrieli, J. D. E. (2003). Neural correlates of the automatic processing of threat facial signals. Journal of Neuroscience, 23, 5627-5633. Armony, J. L., & Dolan, R. J. (2002). Modulation of spatial attention by fear-conditioned stimuli: An event-related fMRI study.Neuropsychologia, 40, 817-826. Beck, A. T., Epstein, N., Brown, G., & Steer, R. A. (1988). An inventory for measuring clinical anxiety: Psychometric properties. Journal of Consulting and Clinical Psychology, 56,893-897. Carretie, L., Hinojosa, J. A., Martin-Loeches, M., Mecado, F., & Tapia, M. (2004). Automatic attention to emotional stimuli: Neural correlates.Human Brain Mapping, 22, 290-299.